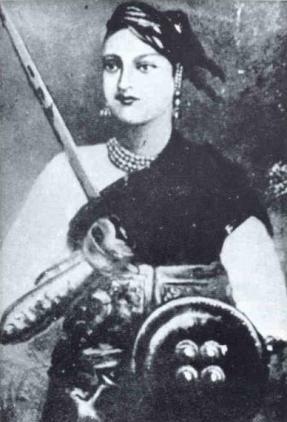 The rather formidable young woman pictured is Lakshmibai, the Rani of Jhansi. She died in 1858 fighting the British in what was the last major action in the Great Indian Rebellion which had started the year before. Her story first caught my attention in a book in which she only rated a couple of paragraphs. Not surprisingly since in the scope of the Rebellion in particular, or Indian history in general it is just one episode among many, a footnote. Indeed in some works on Indian history the whole episode is not mentioned. She was cheated twice by the British. Firstly, in 1854 when they annexed Jhansi on the death of her husband, the Raja. Secondly, when they unjustly accused her of complicity in the mutiny and massacre that occurred in Jhansi 3 years later. As a result of the actions of the British, and others, she was catapulted from being a 'housewife' to the leader of an army and the most important leader of the Indian Rebellion in the space of less than a year. Her death on June 17th 1858, effectively ending the Indian resistance. It could be said the British tried to cheat her a third time with their attempts to blacken her name and reputation. Within India they failed, and there are suggestions that not everyone was convinced in the British camp as well. Nonetheless even today those claims continue to cast a shadow. See here for an example. Today her name is commonplace throughout India, renowned as a leader of the Rebellion, but she was more than a martial leader. In her brief time she cast aside many conventions to unite peoples of all castes and religions in her cause. She put aside purdah, which she only observed with respect to the British in any case, encouraged other women to do the same and trained them to fight and support the main army; Lakshmibai was not the only Jhansi woman to die fighting the British. She cut across the social norms of the time, refusing to accept her fate 'as a woman'. She cared for all her people, and consulted with them at crucial times, and carried them with her. This is, I suppose, my homage to a remarkable woman and to all the other Lakshmibai's the world over, those women who have had to fight, whether with words or swords, to protect themselves, their families, their homes, and, sadly, still are fighting. Perhaps the biggest fight for women right now is that faced by the women of Afghanistan faced as they were by a mysogonistic and psychotic leadership and whose struggles continue. my version of the Rani's story. This is a long version over 3 pages, a brief version in included as part of the Time Line. transcriptions of various relevant documents some by the Rani, some by the British including General Rose, Dalhousie etc, as well as other witness testimony. You don't have to take my, or anyone else's word for anything! and like all good web sites, links to other sites and a Site Map. All of these are shown in a panel on the left of each page - all you have to do is click! Finally, this site is generated using XML and XSLT, and details of that is also linked in the same panel. I would be even more delighted for any information anyone may have on these events and/or the people who participated in them. Perhaps you have studied and researched these times you may have something to add; maybe an ancestor was in Jhansi and there are family stories; and so on. Write to me. i) The usual image of Lakshmibai to be found looks to be a copy derived from the one above. It has the unfortunate effect of giving her a cloven hoof for a right hand. The copyist confusing her hand and her hand guard. That her sword and hand should be so mistakenly combined is somehow symbolic of her story. ii) Her name is also written as 2 words, Lakshmi Bai. I have chosen to use what I think is the more modern usage. '-bai' is an honorific implying respect for a woman. It is applied to both women of Lakshmibai's status and to female servants to show respect for them also. It is like the suffix '-ji' which also shows respect for the person. Gandhi, for example, is often referred to as Gandhiji. iii) Lakshmi is the Hindu goddess of fortune and wealth. Lakshmibai has been likened to the goddess, Durga, who was created by the three principal gods, Brahma, Shiva and Vishnu to force the demons out of heaven. She is portrayed as a beautiful woman, but one that rides a tiger. She is a mother figure, kind and benevolent, and protective, so beware the tiger should you threaten her family. v) The rendition of Indian words into Roman script varies and has changed since 1857. Usually there should be no problem with identification, e.g. Rani was then rendered as Ranee. Also today's letter 'a' was then rendered as 'u' (as in 'under') as in the example of 'sati' and 'suttee'. Lakshmi has been written as Lukshmie. This is because the Indian sound being rendered by 'a' is actually somewhere between the English 'a' and 'u' sounds. The same process has given English the words 'Punjab' from 'Panjab' and 'pundit' from 'pandit'. vi) The Victorian British referred to the events of 1857-1858 as The Great Indian Mutiny, but it also became known as the Indian Rebellion, since it not only involved mutinous soldiers, but also civilians. Some Indians, at least, call it the First War of Independence. I've chosen to refer to it as a rebellion. I don't think it quite qualifies as a war of independence. vii) Copyrights. I think I've given credit where credit is due. I've used images from the books and should I be in breach of copyright I will be happy to acknowledge so - if the original artist or photographer should contact me.